If you haven’t read my previous post introducing our strategy process, you may want to check out Part 1 and Part 2 before reading this. Today I want to introduce you to one of the frameworks we’re using for articulation and analysis of the different options we’re going to explore in our strategy development. It’s called the Business Model Canvas (although we call it an Impact Model Canvas). I’m borrowing it from a fantastic book called Business Model Generation that I’d highly recommend. You can check out the first seventy pages or so for free on their website, as well as some tools such as a high quality version of the canvas for download. The idea behind using something like an Impact Model Canvas is to have a more structured way of writing down all of the assumptions we have in our models. This is how we are explicitly recording our solution hypotheses, which is a key take-away principle from Customer Development as I discussed in my previous post. The canvas also provides common language to compare, evaluate and look for beneficial overlap between different models. Finally it is a great place to start when looking for inspiration on how to modify a model to increase its effectiveness. I’ll discuss this in a later post on Innovations on Impact Models. The Impact Model framework has nine building blocks, drawn on canvas roughly split into a left and right side. I’m going to take the next three posts to discuss each of the elements of the canvas and illustrate how to use it by stepping through our Agriculture as a Business (AAB) program. As is the case with any framework, it’s not perfect, but I believe it’s an improvement over having no structure at all. Here’s a quick picture of the blank canvas. Don’t worry about all the acronyms in the corners just yet, we’ll go through them one-by-one as we fill in the canvas. 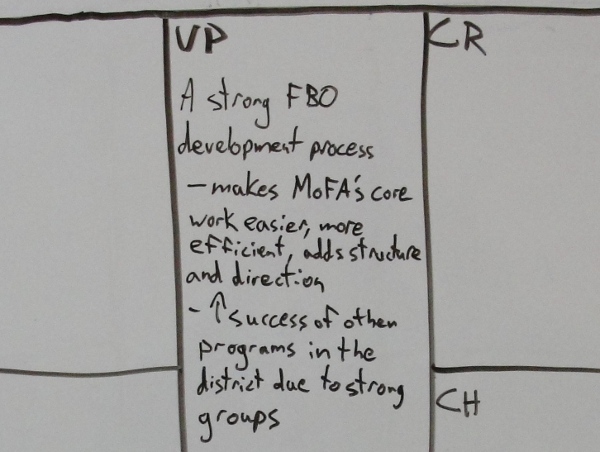 This was our goal in terms of value to MoFA. Notice that farmers are not the focus of the value proposition. This is a bit of a perspective change from our usual focus on farmers first. What we’re aiming to do as we compare Impact Models is to find ways that we can provide value to MoFA that ultimately serve farmers. I’ve alluded to this change in focus in past posts and got a great comment from Anthony, one of EWB’s staff working in Zambia, and I promised him I’d justify it. I’ve written a post on that but you’ll have to wait a day – it ended up dwarfing the rest of the content in this post and it was a bit of tangent so I thought I’d separate it out – stay tuned! By explicitly identifying our Value Proposition, it becomes much easier to measure the effectiveness of the program and decide whether or not we are succeeding. A well articulated Value Proposition provides a strong guide on where to better focus our efforts in order to have a successful program. It allows us to manage our scarce resources effectively and avoid mission creep. There are many different categories of Value Proposition as well. In this case we are creating a new tool that is designed to aid other existing responsibilities. Some of our work around Systems, Management and Leadership focuses less on bringing a new tool or process but on how to increase the efficiency and effectiveness of existing management processes. Robin’s work on the Agriculture and Entrepreneurship course provides value by increasing the skills that students acquire through a new teaching method not common in Ghana – a practical group project. It’s exciting (to me at least) to explicitly have these Value Propositions for the work we are doing, and allows us to give a one-liner for the results we are working towards when people ask what we actually do here in EWB. Another key point to recognize about the Value Propositions that we provide is that they should not be ongoing services. At the end of the day we need to pass off any successful ideas that we develop with MoFA entirely over to MoFA. In this way were are like long-term consultants, but it is often difficult to position ourselves that way within the districts we work in. Districts are under resourced and it is difficult not to step in and pick up some of the slack if things aren’t running smoothly, which becomes a dependency. As we move forward with more explicitly articulated Value Propositions I hope it will be easier for MoFA to understand our role, what value we are providing, and how it fits into longer processes within MoFA itself. Alright, this is a bit closer to the bite-sized posts I was hoping to write. Look out for my comments MoFA as our customer tomorrow, shortly followed by a post on the rest of the right side of the canvas. As always would love to hear your feedback and comments! This entry was posted in (Human) Development and tagged customer development, impact model canvas, strategy. Bookmark the permalink. You should put a “Like” button so that I can like your post publicly! Anyhoo, well done on this series of posts so far. I love how you’re articulating in a way that is very accessible and logical. I think it’s pretty unique how transparent you’re being in the forming of the strategy and I’m definitely looking forward to hearing more about the boxes in the impact model and how they relate to our team’s work. Hmmm, good idea. I’m a laggard on the whole facebook wave but maybe I should let others promote through it at least! I’ll see what I can do! Pingback: Strategy Development in small-meal-sized chunks: Parts 3 & 4 « What am I doing here? I’m interested in why you’re calling it an Impact Model Canvas and where the impact features. 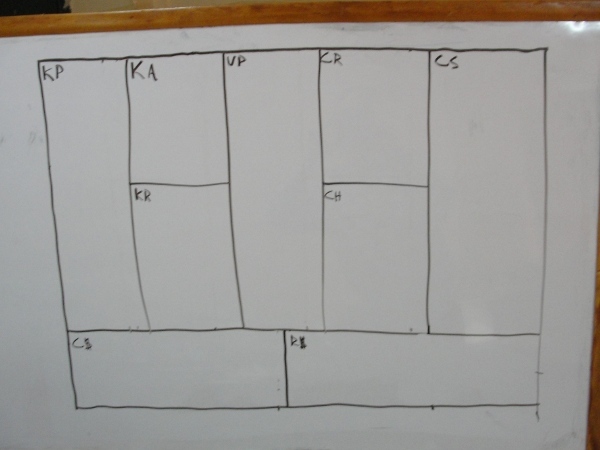 Is it that you are identifying the impact and benefits in each component as you populate the business model canvas? Coincidentally, in 2011 I started to speak of the business model canvas with an “impact layer” – that is, I still use the tool, as it was intended, to identify the business and enterprise components and relationships AND I add an impact layer to the evaluation. I finally got around to introducing the tool and creating a couple of videos illustrating what I meant. Part 1 and Part 2 are available on YouTube. I haven’t filmed Part 3 yet! All the best for your impact work!